I was meaning to do a post on this product a while ago already however, I never got around to it and now I finally can! You all know by now that I’m a huge fan of Garnier’s products because I’ve mentioned it in part 1 of this post as well as the post on Garnier’s BB Creams. About this product: Micellar Cleansing Water is an easy way to remove make-up, cleanse and purify the skin, eye area and lips in one step without rinsing. How does it work: For the first time, Garnier Micellar technology is formulated specifically for combination to oily and sensitive skin. Like a magnet, the cleansing agents capture and lift away dirt, make-up and excess sebum from the skin. Enriched with purifying agents, it helps fight the appearance of impurities. The skin feels refreshed with no need to rub to cleanse and remove make-up. What I Think: On the bottle, it states that this product is for combination to oily and sensitive skin, which is great for me because my skin changes all the time, and most of the time it changes to oily and I tend to get breakouts. I love the packaging, the water looks like a pale pastel blue colour and it has a pop-up lid that shuts to prevent leakage. This Micellar Cleansing Water removes my makeup very well without irritation or redness and makes my skin feel cleansed and refreshed. In the past I never bought makeup remover products, I only made use of coconut oil which worked really well for me and when I first saw the Pure Active Micellar Cleansing Water I was in love the packaging, but skeptical in purchasing this product. The reason I was skeptical at first was because I’m super cheap (lol) and I was definitely not going to waste money on water (lol) however, I went on google and read up on a few reviews, and from what I read it sounded good and I just thought what the hell, I’m going to get it. I bought the product and thought Garnier has never let me down once, and you know what? I love this product! To hell with coconut oil (lol) Micellar Cleansing Water all the way and now I can’t stop using it. This bottle is 400ml = 200 uses, comes from a good brand and it’s very affordable. 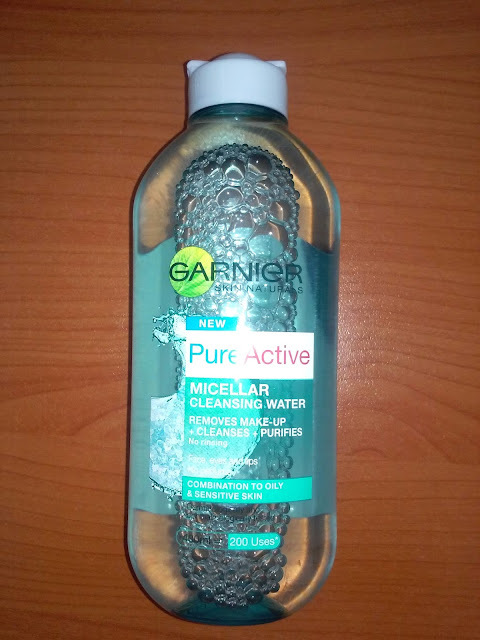 If you are not using Garnier’s Pure Active Micellar Cleansing Water then you are missing out because this product will Change your life! How to use it: Apply the product to a cotton pad and wipe the face, eyes and lips. No rinsing required. Thank you for reading. I hope you enjoyed this post.